The site is said to focus solely on business ideas, and is designed to tap into the opinions of the wider developer and entrepreneur community. 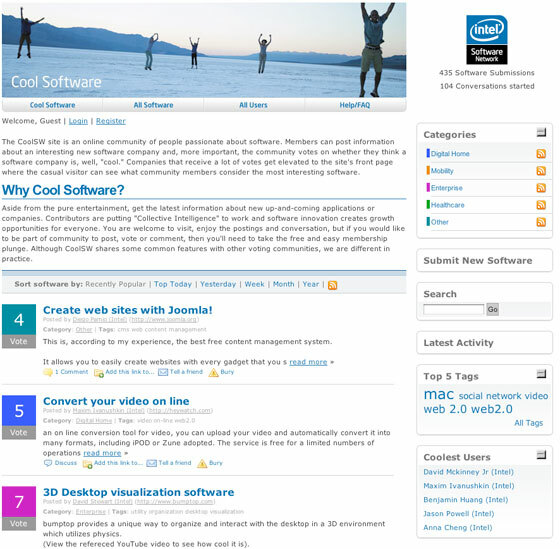 According to a report at Venture Beat, the site cost around $40,000 to develop and has been tested internally, with Intel soliciting views from its employees about the hottest software companies. Like any good Digg clone, it appears that it hasn’t taken too long for it to be gamed, with the top result at the time of writing being for the Open Source CMS Joomla. Even if it isn’t gamed for advantage by some, it’s a little strange that Intel wants to use the site to find “the next Google” whilst offering it to the public; after all if the model does identify the next Google, wouldn’t everybody see the result and have an opportunity to jump in before Intel does?